I often talk to my patients about maintaining an active life (or gaining one) and not just watching their children play sports or dance classes or band practices. I talk to them about trying to eat healthy (aim for 80-90 per cent of the time, allow for special celebrations, etc). I am not a nutritionist, so I will refer them or suggest books. I gave my mother Type 2 Diabetes for Beginners by Phyllis Barrier, MS, RD, CDE when she was first diagnosed. Yes, I have a family history of Type 2 Diabetes. My grandmother (maternal), my mother, and a brother. I am very aware that I have to watch my weight and exercise to try to prevent myself my manifesting this disease. I am also aware that I have a weakness for sweets, especially chocolate. Here are my answers to the diabetes risk test found at the American Diabetes Association web site. You may wish to take it yourself and see what your risk is. You have scored 7 points . This means I am at low to medium risk for having type 2 diabetes now, BUT may be at higher risk in the future. By simply changing my answer to question #4 to true (I get very little or no exercise) my score would go to 12 and put me in the high risk catagory. [0-2 is very low risk; 3-9 is low to medium risk; 10 or more is high risk]. For more information, call 1-800-DIABETES (1-800-342-2383) Monday through Friday, 9 am – 8 pm (EST). I'm going to get up and go take my dogs for a walk. I'd like to write a memorial to a friend of mine. Her name is Virginia Johnson (Jan 21, 1928--June 27, 2007). She was married to Jim Johnson. This December would have been their 60th wedding anniversary. She was the first woman to run for governor in Arkansas (in 1966 and no woman has ever won, yet). She and her husband have three sons (and daughter-in-laws) and six grandchildren She was a remarkable woman, intelligent, caring, a great cook. She will be missed. She had only one flaw that I am aware of--she smoked. And it got her in the end. She died of lung cancer. Smoking is responsible for nearly 1 in 5 deaths in the United States. Smoking is linked to at least 10 different cancers (lung, bladder, esophageal, laryngeal, oral and throat cancers, acute myeloid leukemia, cervical, kidney, pancreatic, and stomach). Smoking is linked to reproductive effects and sudden infant death syndrome. Smoking is linked to periodontitis. Smoking is linked to osteoporosis. Smoking is linked to poor wound healing. Smoking is linked to Alzheimer's, impotence, Lupus, etc. In addition, there are non-medical reasons not to smoke. A pack-a-day habit cost around $1000 a year. You may lower your car insurance costs. Please, do yourself (and your loved ones a favor) and if you smoke quit. If you don't, good for you. I hope you never take it up. Mending holes in clothing or in earlobes can be done. Some methods work better than others. Often with both, simple preventive measures are very useful. When mending clothes, resewing a button before it is lost is best. Using an iron-on interfacing to re-inforce an area in a garment where the fabric is getting thin can prevent the hole from occuring or at least delay it, giving longer life to the garment. For earlobes, not wearing heavy ear rings can help prevent the stretching of the hole. Being careful when put on or removing clothing so as not to "catch" the earring can help prevent the lobe from being torn. Being careful around babies/toddlers who want to play with shiny/dangling objects can help prevent the lobe from being torn. Another way is to use the "earlobe support" which is a stick-on disc that help support the earlobe when heavy earrings are worn. Used early, this can prevent the stretching or slow tearing of the lobe due to the weight of the earring. Once the stretching occurs or the tear is completed, then the only way to fix it is to repair it. There are variations on "how" this is done, but they all require excising (freshing) the edges so they can be sewn back together. The variations are mainly in how the excision is structured–straight, z-plastied, or L-shaped. I do not think the straight excision is the best way to do the repair. If the scar "shortens" at all (as straight scars are prone to do), then the lobe is "gathered" up and ends up "W" shaped at the bottom. The other reason is that unless you (the patient) are very good at repositioning the new hole to the side (either) of the scar (which is weaker by at least 20% of the surrounding skin), the tear is very likely to re-occur as the earrings pull-through the scar over time. The Z-plasy or L-shaped scar avoid the "W" by changing the scar into a non-straight scar. Which one is best will depend on the tear and shape of the earlobe being repaired. Also, it may depend on whether there is an intention to re-pierce the earlobe. Not all do. As I have not figured out how to put sketches in my text, I have linked here to Dr. Michael Bermant, MD site. This is usually an office procedure done using a local block. Most insurances will not cover this procedure as they consider it cosmetic in nature. A really good article with nice, clear instructions on the Z-plasty technique is REPAIR OF THE SPLIT EARLOBE USING A HALF Z-PLASTY; Journal of Plastic & Reconstructive Surgery, Vol 101(3):855,856, March 1998; Gajiwala, Kalpesh M.S., M.Ch. Scar placement is usually either in the bicipital groove or more posterior at the most inferior point of the upper arm while it is raised and abducted (positioned away from the body). The second choice is less visible in everyday activity. Either way, the scar is there. The scar can be quite apparent, so this procedure should never be undertaken if the patient is not willing to make this trade-off (less skin, but a significant scar). This is the 25th year since my UAMS class graduated. The reunion is in September. Somehow I got designated the "host" of our class to help the Alumni Office get folks to come. This feels like an odd fit to me as I was never the social butterfly, but I have taken the "job" seriously. I have learned how to set up a Google calendar just for the group, adding in local team schedules (University of Arkansas Football, Arkansas Travelers baseball) and looking up Art Center information, etc. I have set up a Facebook Group page to try to encourage input on activities the class would like, sharing of information, and sharing of pictures. So far very few takers. Still I keep trying. I have googled nearly everyone looking for pictures (several hospital photos) which I added to the Facebook page (so far 43 pictures). Two of our local classmates (married to each other) have offered their home for a pig roast. We will probably take them up on the offer. Our class had yearly actual pig roast while in school. We dug our own pits, cooked the pig, and the "pot-lucked" the sides and desserts. It was great fun! This one will be catered, but it will still be fun. The sad (bitter-sweet) part of all this searching/planning is remembering the ones who are no longer with us. I think we have lost six (have asked the Alumni Office if they know for sure). The first one we lost, Morris Hughes, was in 1988 to a plane crash. The class set up a scholarship fund in his name. Another was a death to a motor vehicle accident. One to a heart attack. The saddest was a suicide. I always find suicides sad, but especially physician suicides. I always wonder if it was the professional part of their life that "pushed" them over or their personal side or both. I always regret that they were not able to ask for help when they would so willing give it. Once or twice a year I have a patient who is Latex allergic. I use it as a reminder to review the information. There is a wonderful article, Latex Allergy by Sumana Reddy, MD published by the American Academy of Family Physicians. I don’t think I can do a better review, so lets just hit some highlights. The natural latex allergen is from the rubber tree Hevea brasiliensis. Those persons most susceptible to sensitivity are persons with significant cumulative latex exposure, such as those in the health care and rubber industries, as well as those undergoing repeated surgeries, especially if those surgeries are early in life (e.g. spina bifida patients). Avoiding exposure to NRL (natural rubber latex) allergens is the only effective means for prevention of sensitization. Avoidance of powdered NRL gloves results in a decrease in sensitization and subsequent problems. It has been shown that continued avoidance can result in complete loss of sensitization. Avoidance can be hard to do, as a large number of medical and nonmedical products have NRL in them: elastic bandages, tourniquets, Foley urinary catheter, Penrose drains, tape, rubber innersoles of shoes, balloons, latex mattresses, household rubber gloves, and inflatable mattresses. There is also a cross reaction to other plants and foods: Poinsettia, banana, avocado, passion fruit, chestnut, kiwi fruit, melon, tomato, celery. Are you allergic to any foods (remember those above)? Do you experience rash, oral itching, swelling or wheezing when exposed to these foods? Do you ever have swelling, itching, hives, shortness of breath, cough or other allergic symptoms during or after blowing up a balloon, undergoing a dental procedure, using condoms or diaphragms, or following a vaginal or rectal exam? Have you ever had surgery? What kind? Surgical patients who are Latex-sensitive should be scheduled as the first case of the day, when aerosolized latex particles are at a low. If blood pressure cuffs and tubing are made of latex, the patient's extremities should be wrapped to prevent contact. While it has been recommended that medications not be drawn up through rubber-stoppered vials or allowed to sit in preloaded syringes that contain latex rubber, and that latex ports should not be used for intravenous injections, these precautions appear to be impractical for all but the most exquisitely latex-sensitive patient and are likely not necessary. Non-latex gloves should be worn by surgeons and staff. Premedication with antihistamines, steroids and histamine H2-blockers is sometimes carried out, but anaphylactic reactions have occurred despite such pretreatment. If you are a latex-sensitive patient, please, wear a Medic-Alert identification. Consider carrying an epinephrine auto-injection kit. Maybe carry extra pairs of nonlatex gloves for emergency medical or dental care. You know size does matter. In quilting and in bust size. When making a quilt, it helps to decide what you want its function to be. 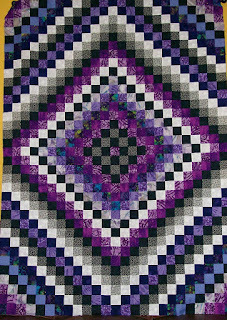 For the QOV group, the suggested size is --Your top should be at least 50"x 60". Please don't go larger than a twin sized (63" x 87"). I try to make mine 50" X 70". 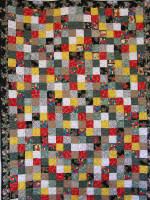 If I am making a baby quilt for a friend or relative, then it will vary, 36" X 48" or maybe 45" X 60". When I am talking to a woman about breast size, the question is often what size should I be? We (she and I) may be deciding how much larger (an augmentation) or how much smaller (a reduction) to make her breasts. The deciding factors in my mind are her body type (height, weight, bone structure), her personality (or as good a handle as I can get on it during our time together--I ask them to be honest with themselves about "entering a room bust first"), how they want their clothing to fit. Off the rack clothing is usually sized for a B/C bra cup for the corresponding chest measurement. Anyone fuller busted often has to buy a size larger and then the shoulders may be too large, or safety pin the "gaping buttons" or have clothing custom made. So the augmentations, I try to caution not to go too large (C cup for shorter and up to D for taller women). For reduction patients, I try to caution them not to go too small (some think they want to be A or B cups due to the extreme discomfort they have endured). Most of us women have hips that need C cups to truly balance them, and these women will get the relief they seek in part from the intrinsic lift that comes with a breast reduction. The final say in size is theirs (the patient), but when they ask my opinion I tell them. I am conservative when it comes to breast size. For my taste, bigger is not always better (most of us can not carry off the Dolly Parton look and yet she makes "hers" look good). 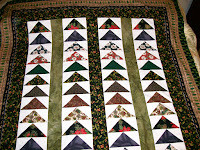 For me part of the lore of quilts is the names. This pattern is called both "Sunshine and Shadow" thought to refer to the different times in our lives, the good and the bad, the difficult and the easy times, the rainy and sunny days. The other name is "Trip Around the World". It makes me think of the old movie--Around the World in 80 Days-- or trips I'd like to take or trips friends have taken (and I through them). 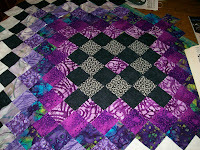 This quilt is in the planning stages and may end up with different colors, but right now I like this contrast. For me the prevention of DVT (deep venous thromboembolism) is more important than the diagnosis. As I read several sources of medical literature, it seems the family physicians are more concerned with the diagnosis, and that is probably as it should be. For them often the presentation of DVT may be a symptom of some under-lying illness (ie cancer). For surgeons, we want to prevent being the cause of DVT’s in our patients, because for us DVT is a complication not just a disease process. I (we) don’t like complications. Just different perspectives, as we all work towards the goal of the patient’s good health. All surgical patients should have intermittent pneumatic compression devices used (unless the procedure will be less than 1 hour). Prevention of Venous Thromboembolism in the Plastic Surgery Patient; Plastic and Reconstructive Surgery, Vol 114 (3) September 1, 2004, pp 43e-51e. Deep Venous Thrombosis Prophylaxis Practice and Treatment Strategies among Plastic Surgeons: Survey Results, Plastic and Reconstructive Surgery; Vol 119 (1) January 2007, pp 157-174. I must confess up front that I don't get tattoos. To me they are like graffiti on public buildings, not art or murals. To me the tattoo on a woman's shoulder ruins the lovely evening gown or sundress she wears. But that's me. I'm not alone--"Years ago, I naively failed to anticipate that laser tattoo removal would inevitably lead to—more tattooing. This is sad, because I have never met a tattoo more beautiful than the skin onto which it was placed. With equal naivete perhaps, I suggest that we should continue to work on making tattoos safer and more removable than ever. Otherwise, what looks like sunlight at the end of this tunnel is surely the headlight of an oncoming train filled with unhappy, tattooed passengers." R. Rox Anderson, MD, Department of Dermatology, Massachusetts General Hospital. Humans have marked their bodies with tattoos for thousands of years. "These permanent designs—sometimes plain, sometimes elaborate, always personal—have served as amulets, status symbols, declarations of love, signs of religious beliefs, adornments and even forms of punishment. Joann Fletcher, research fellow in the department of archaeology at the University of York in Britain, describes the history of tattoos and their cultural significance to people around the world, from the famous "Iceman" a 5,200-year-old frozen mummy, to today’s Maori." (Smithsonian Magazine). There was a nice article recently in the New York Times that covers the regret that often comes months to years later after getting the tattoo--"Erasing Tattoos, Out of Regret or for a New Canvas". Today's lasers have made it easier to have them removed, but the cost of removal is still many times the cost of getting one. There is also safety issues to be considered (not just the regret factor) when getting a tattoo. Today's inks are not all specifically created for tattoos and may result in allergic reactions, infection, and severe cellular inflammation or excessive tissue growth around the wound site known as granulomas or keloid scars. These inks have known toxic and carcinogenic properties and are not easily removed even with the improved lasers. These risks and complications led to the development of a new ink, Freedom-2, by leading dermatologists and academic institutions. This ink combines products known to be safe for human usage, making it safer and more easily removed. The innovation of safe, quality inks for the purpose of tattoos, permanent cosmetics and the creation body art is at the heart of Freedom-2. Freedom-2 inks are specifically designed to be easier to remove in the future. Tattoo removal can be done by laser, dermabrasion, or direct excision. None of these are necessarily simple, so if you see tattoos as art, please, just be sure you truly want it before proceeding. Then enjoy your "art". I went to the local Red Cross today to give blood, but they wouldn't take any. My Hct was too low. Your Hb must be 12.5 or above, the Hct must be 38% or above. So now I must work on getting it up. Mine is simply iron deficient anemia (giving blood and not enough iron in my diet). This can sometimes be a problem postoperatively too. We don't give blood to surgery patients as readily as when I was a medical student. Now we won't treat with transfusion post-surgery unless the patient is still bleeding, the Hct is less than 29%, or the patient is symptomatic (short of breath, weak, etc). Now that I have become deficient in iron to the point that I have developed anemia, increased intake of iron-rich foods is beneficial, but usually isn't enough to correct the problem. I will need iron supplementation to build back my iron reserves and still meet my body's daily iron requirements. For mild iron deficiency anemia, a daily multivitamin containing iron will often be enough. But typically, doctors recommend iron tablets — such as prescription ferrous sulfate tablets or an over-the-counter supplement. These oral iron supplements are usually best absorbed in an empty stomach. However, because iron can irritate your stomach, you may need to take the supplements with food. Iron absorption is increased when taken with vitamin C (orange juice). Iron deficiency anemia can be prevented by eating foods rich in iron, as part of a balanced diet. Eating plenty of iron-containing foods is particularly important for people who have higher iron requirements, such as children and menstruating or pregnant women or regular blood donators. Foods rich in iron include red meat, seafood, poultry and eggs. Meat sources of iron are easily absorbed by your body. Plant-based foods also are good sources of iron, although they're less easily absorbed. Among the best are iron-fortified cereals, breads and pastas. Beans and peas, dark green leafy vegetables — such as spinach — and raisins, nuts, and seeds also contain iron. You can enhance your body's absorption of iron by drinking citrus juice when you eat an iron-containing food. Vitamin C in citrus juices, like orange juice, helps your body better absorb dietary iron from animals and plants. Maybe I'll have a nice spinach salad with blueberries & almonds, along with my iron supplement. 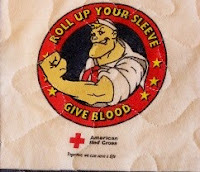 Then I'll try to give blood again in a few months (give my body some time to build back up). After a surgical patient of mine told me that she was taking Excedrin (2 days after her surgery) I wanted to review which "common" products that contain aspirin. [I may need to list them all rather than just saying "no aspirin".] Excedrin, for me, is an easy one. I have to remind myself that Pepto Bismol contains aspirin. I also thought I would share a brief review of aspirin. Folks my age (I’ll hit 50 yr later this year) grew up with aspirin. It’s what we used for fever and headaches. My nieces and nephews have never had aspirin. Aspirin will be 100 years old this October! Aspirin was developed in Germany by a chemical process described by research chemist Felix Hoffman on October 10, 1897. The active ingredient in aspirin, acetyl salicylic acid, is a synthetic derivative of a compound, salicin, which occurs naturally in plants, notably the willow tree. Extracts of willow were traditionally used in folk medicine and as early as 400 BC the Greek physician Hippocrates recommended a brew made from willow leaves to treat labour pains. Later in 1763 an English clergyman, Reverend Edward Stone carried out the first proper scientific study of the herbal medicine when he described the benefits he observed after giving ground up willow bark to 50 parishioners suffering from rheumatic fever. How aspirin works was a mystery until relatively recently. During the 1970s the British scientist Professor John Vane discovered that it blocked an enzyme needed for the production of natural hormones called prostaglandins involved in many body processes including pain and tissue injury. In 1982 Professor Vane, now Sir John Vane, won the Nobel Prize for Medicine for this work. The liver appears to be the principal site for salicylate metabolism, although other tissues may also be involved.. The half-life of aspirin in the circulation is from 13 to 19 minutes so that the blood level drops quickly after absorption is complete. However, the half-life of the salicylate ranges between 3.5 and 4.5 hours, which means that 50% of the ingested dose leaves the circulation within that time. [The affect on platelets can be "felt" up to 10 days, which is why patients are asked not to take aspirin for 2 weeks prior to surgery.] Excretion of salicylates occurs principally via the kidneys. Salicylate can be detected in the urine shortly after its ingestion but the full dose requires up to 48 hours for complete elimination. ASA is one of the most frequent causes of accidental poisonings in toddlers and infants. The adult aspirin is 5 grains (325 mg), the "baby" aspirin is 1.25 grains (81 mg). A toxic dose of aspirin is equivalent to 1 gr per pound of body weight (150 mg / kg). A minimal lethal dose is equal to 3-4 grains / lb (450 mg / kg). Symptoms of an overdose: In mild overdosage these may include rapid and deep breathing, nausea, vomiting, vertigo, tinnitus, flushing, sweating, thirst and tachycardia. In more severe cases, acid-base disturbances including respiratory alkalosis and metabolic acidosis can occur. Severe cases may show fever, hemorrhage, excitement, confusion, convulsions or coma and respiratory failure. I like puzzles. I am fairly good at Sudoku. I can never finish the New York Times crossword. I like quilts. So a while back I did a quilt based on sudoku. It was for the QOV Foundation. So I wanted the quilt to be close to 50" X 70" in size. Since the sudoku puzzle is a grid of 9 rows by 9 columns. I planned the quilt to be 3 of those 9 X 9 grids across and 4 down for a total of 12 grids. I used 9 different fabrics as if they were the numbers. This is how it turned out. The quilt is 54" X 72", each square is 2". Many people take these suppliments with no thought of "side effects" or interactions with their prescriptions. Chondrotin and heparin are similar in chemical composition and researchers speculate that bleeding complications may arise from chondroitin use, particularly when used in combination with other blood-thinning medications. Because echinacea does have immunostimulation properties, it is contraindicated in systemic and autoimmune diorders. The immunostimulatory effects can offset the immunosuppressive actions of corticosteroids and cyclosporin. Side effects of echinacea also include GI upset, headache, dizziness, and potential allergic reactions. Prolonged use of ecchinacea (8 weeks) has been documented to cause tachyphylaxis through an unknown mechanism. Echinacea is also an inhibitor of cytochrome P450, 3A4, and sulfotransferase and can potentiate the toxicity of drugs that are metabolized by these pathways (benzodiazepines, barbiturates). Gingko biloba has the ability to inhibit platelet-activation factor and possesses an anti-inflammatory effect. Gingko biloba has induced spontaneous hyphema (bleeding from the iris in the anterior chamber of the eye), subarachnoid hemorrage, and spontaneous bilateral subdural hematomas. It should not be used with other anticoagulants. Other side effects of gingko include headache, GI symptoms, and allergic skin reactions. The active ingredient in garlic is allicin, which has been reported to inhibit platelet aggregation. It should not be taken with other coagulation inhibitors (e.g. warfarin, heparin, nonsteroidal anti-inflammatory inhibitors, and aspirin). Other side effects of garlic include halitosis, nausea, hypotension, headache, bloating, and possible allergic reaction. Ephedrine, a chemical contained in ephedra, has medical uses, mostly in operating rooms and intensive care units. It is sympathomimetic agent and causes positive inotropic and chronotropic responses to raise blood pressure and heart rate, respectively; dilates bronchioles; and increases metabolic rate. Side effects such as psychiatric disturbances, heart attack, cardiac dysrhythmias associated with volatile general anesthetic agents (e.g., halothane) and cardiac glycosides (e.g., digitalis), stroke, and even death. Of note, patients taking ephedra under general anesthesia can have severe hypotension that can be controlled with phenylephrine instead of ephedrine. It has become important to ask patients about suppliments. It is important to caution them to stop them prior to surgery. Gingko biloba should be discontinued at least 36 hours before surgery. Garlic should be discontinued at least 1 week prior to surgery. The exact time for chondrotin is unknown, so recommendations are based on guidelines from the American Society of Anesthesiologists, which advises that all herbal medicines without formal study be discontinued at 2 to 3 weeks before an elective surgical procedure. Echinacea should be discontinued 2-3 weeks prior to surgery. Ephedra should be discontinued at least 24 hours prior to surgery. I saw a young girl recently with a dog bite to her face. Her mother brought her in for me to check the scar (and remove the stitches placed in their local ER). 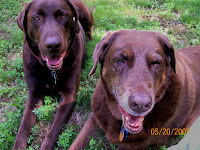 The third full week of May is National Dog Bite Prevention Week, but it never hurts to review this information as more than 4.7 million people a year receive bites from man/woman’s best friend (and I dearly love my dogs). The Quilt of Valor Foundation has asked for tactile quilts to give to blind or sight-impaired soldiers. The tactile sense training seems to help them train the brain to "see" in other ways. The reason is not fully understood, but is known as sensory substitution. This refers to the capacity of the brain to replace the functions of a lost sense by another sensory modality. The most commonly used form of sensory substitution is Braille reading which allows the blind to read by touch (somatosensory system). So instead of just using the usual quilting cottons, the tactile quilts are made of fabrics with interesting feel: corduroy, jeans, flannel, wool (washable), linen, pleated fabric, ruched fabric. The one constant is the fabric needs to be washable. I know that one of the things I love about fabric (and yarn) shops is "touching" the fabrics. I won't buy a fabric (or yarn) if I don't like the way it "feels" to my touch. So I tried to find more information as to how this "touch" (somatosensory system) was so important in training the vision impaired. I found a few sources, like this study done by Nicholas A. Giudice at the Minnesota Lab for Low-Vision, Center for Cognitive Sciences,University of Minnesota, it was shown that "blind participants demonstrated activation in primary visual, extrastriate and higher level visual cortices in response to tactile stimulation, whereas sighted subjects showed no such consistent "visual" activation to the same tactile stimuli. An important new finding is the observation of functionally relevant reorganization in all three blind participants. That is, while meaningful stimuli, like the Braille, embossed roman letters and tactile shapes showed the greatest and most defuse occipital activation in the blind subjects, the presentation of tactile noise alone showed little activation in these regions. In concert with this progression of salience and functional relevance is a fairly consistent pattern of areas associated with higher visual processing being activated by the more meaningful tactile stimuli across the blind participants." So the stitches are out, What can be done to minimize the scar? Scars may fade, but will not disappear. First--remember that the wound/cut/incision is not "technically" healed at this point. The wound is just now entering that third phase, the maturation phase, of healing. The stitches need to come out early so that there will not be "stitch marks" or "rail road marks" from the stitches themselves. The area needs to still be protected from tension. Steristrips can do this, but so can a piece of paper tape applied along (or across) the "healed" scar. Both of these allow the strip or tape to have the tension placed on them rather than actual scar. The tensions are the scar will vary depending on its location. The shoulder gets a lot of tension as use of the arm is allowed (If we didn't allow use of the shoulder, it could "freeze" up--that's worse than a wide scar.) The breast/chest skin gets some tension with arm use, but can be decreased by not allowing backward motions of the arm (ie vacuuming) or full stretching, as in reaching for the top shelf. Second--protect the scar from the sun. Apply sunscreen daily to the scar, if exposed (face, neck, hand), for 6 months or more. This will allow the red color (as the increased capillaries are absorbed) to fade. Third--scar massage helps in the "realignment" of the collagen during the maturation phase (up to two years). It is easier to do scar massage if you use something like cocoa butter, vitamin E, Mederma, Aquafor, or just a favorite lotion. The key here is to do it. Gently massage along the scar. Gently "pinch" the scar up if the scar feels like it is trying to "stick" or adhere to the underlying tissues. Fourth--If the scar allows (won't work on areas with great movement), silicone sheeting products can be used. It is hard to use both this and some of the scar massage suggestions at the same time. The Mederma or vitamin E, etc must be cleasned off the skin really well befor applying the silicone sheeting. Scar revisions are not done for a minimal of 6 months, as we know that scars change, flatten, and fade. Exceptions to this rule are when the scar is obviously creating a tether across a joint (can not straighten the elbow) or deforming (pulling the lower eyelid away from the eye). If the scar appears to be getting "puffier" or thicker, it can often be helpful to inject the scar with Kenalog. This must be done carefully, as the injection can thin the scar/skin (atrophy) and decrease pigmentation in the skin. These risks must be weighed against the benefits expected to be gained. Other things that can help with healing include: not smoking, good nutrition, and keeping other disease processes under control (ie diabetes and hypothroidism). All wounds heal through the same orderly process. Consider the simple laceration which is a well-studied wound. There are three phases of wound healing: the inflammatory, fibroblastic, and maturation stages. The Inflammatory phase begins with the injury/laceration which is the stimulus needed to initiate the cellular and vascular response that serve to clean the wound of devitalized tissue and foreign material. The initial changes are vascular--a transient 5-10 minute period of vasoconstriction (aids hemostasis) followed by active vasodilation. Inflammation begins after injury and peaks at three to five days. The wound site swells as the biochemical ingredients needed for healing gather: leukocytes and monocytes for bacterial phagocytosis (wound cleaning) and lysis, fibrinogen for adherence of wound edges, histamine, prostaglandins, and vasoactive substances for hemostasis. All this must occur to prepare the wound for the succeeding phases of healing. Therefore, drugs which limit inflammation, such as non-steroidal anti-inflammatories or steroids, can slow the healing of a wound. The Fibroblastic Phase begins on day 2 or 3 with fibroblasts moving into the wound along a framework of fibrin fibers. These fibroblasts begin to proliferate and position themselves for their principal task, collagen synthesis. As collagen content increases, the number of synthesizing fibroblasts begin to decrease until the rates of collagen degradation and synthesis are equivalent (collagen homeostasis). This is the time when the wound site strengthens. Sutures may be removed in three to fourteen days, depending on their location. However, the wound's tensile strength and collagen content increase over the next several weeks; collagen turnover within the wound continues indefinitely. The Maturation Phase (or remodeling phase) begins approximately 3 weeks after injury and lasts the longest. This phase may continue for several years, with concomitant improvements in wound appearance. During this interval collagen synthesis and degradation are accelerated (no net increase in collagen content), large numbers of new capillaries growing into the wound regress and disappear, and collagen fibers initally deposited in a haphazard fashion gradually become more organized and arranged into a pattern determined by local mechanical forces. The formerly indurated, raised, and pruritic scar becomes a softer, less conspicuous scar, while the wound continues to gain tensile strength. As new collagen is deposited during this phase, more stable and permanent cross-links are established. The tensile strength of a wound is a measurement of its load capacity per unit area. All wounds gain strength at approximately the same rate during the first 14-21 days, but thereafter the curves may diverge significantly according to the tissue involve. In skin, the peak tensile strength is achieved at approximately 60 days after injury. Even given optimal healing conditions, the tensile strength of a wound never reaches that of the original, leveling off at about 80%. If more information is desired on wound healing, a very good review is the article "Wound Healing: An Overview" written by George Broughton II, M.D., Jeffrey E. Janis, M.D. and Christopher E. Attinger, M.D., published in the Plastic & Reconstructive Surgery Journal Volume 117, Number 7S, June Supplement 2006. A recent study by scientists at the National Jewish Medical & Research Center and the University of Colorado Health Sciences Center have discovered that skin cells ward off infection with a protein called human β-defensin-3. This study helps explain why infection of healthy skin cells rarely occurs, even though they are constantly exposed to bacteria. One more reason to be amazed by this amazing organ--skin. Today my medical school classmate was honored with a "chair"--The Investiture of Robert Leroy "Lee" Archer, MD, the inaugural recipient of the Major and Ruth Nodini Chair in Neurology. Lee (Dr. Archer) is an associate professor in neurology at University of Arkansas for Medical Sciences (UAMS). He was honored with the endowed chair funded by friends, family and patients who want to remain anonymous. He chose the name (the Major and Ruth Nodini Endowed Chair in Multiple Sclerosis and Related Autoimmune Diseases) – to honor the longtime, highly respected El Dorado residents and relatives of his wife, Nancy. Lee was born in El Dorado, AR in 1956. He attended El Dorado Public Schools. He went to the University of Arkansas at Fayetteville on a track scholarship, graduating in 1978 with a BS degree in Natural Sciences. He married Nancy (Huskey) in 1977. He graduated from the UAMS College of Medicine in 1982 (class president), followed by an internship and Neurology Residency at UAMS. He immediately joined the faculty and next year will celebrate 30 years of being on the UAMS campus. He achieved the rank of Associate Professor in 1992. 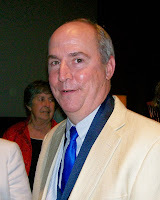 He has received numerous teaching awards from students and humanitarian awards from both students and colleagues. He currently serves as chairman of the University Hospital Ethics Committee. He serves the community by organizing international medical mission trips to Honduras through his church, Trinity Presbyterian. He currently serves on the Boards of ARORA, the Pulaski County Medical Exchange, the Pulaski County Medical Society, and the Arkansas Division of the National Multiple Sclerosis Association. He is the immediate past president of the Pulaski County Medical Society and has served on the Board of Directors of the Arkansas Medical Society. He developed an interest in multiple sclerosis early in his career after a visit from local representatives of the National M.S. Society. It has continued to be the primary focus of his clinical practice. He approached family and friends, who wish to remain anonymous, with the desire to fund an endowed chair for multiple sclerosis, to further the level of care and research at UAMS. He asked permission to name the chair after Major and Ruth Nodini, who had provided lifelong support and advice to Nancy and to him for over 30 years. Today we (family, friends, teachers, coaches, mentors, nurse, and M.S. advocates) honored him. A patient calls–My right implant has ruptured. I woke up this morning and now my right breast is smaller than the other. I gently correct her–Your implant has deflated. Saline implants deflate, they don’t rupture. Patient–Is it going to harm me?/I have a trip planned for this coming week. Me--Your body will simply absorb the IV saline that was used to fill the implant. It isn’t a medical emergency though it can be embarrassing. We can take our time and fit it into your life/work schedule (If patient is pregnant, it can safely wait until the delivery of her baby.) Put a shoulder pad or some other padding in your bra to even it out for now. When would you like to be seen? Patient–Well what do we have to do? I didn’t realize they would do this. Me–Yes, I reviewed this with you before surgery. All implants fail at some point. Just like anything else man-made. Patient–So what do we do now. Me--I will need to see you and then call the implant company to arrange the free implant replacement(s). Do you know if you have the "extended warranty"? Patient–No, I don’t think so. I think my surgery was yyyy. Me–Okay, the extended warranty program didn’t exist prior to October 1, 2000, so you won’t get any other financial help. Just the free implants. Patient–I will have to talk to my husband and see if we can afford that. Me–Okay, just let me know when you want to go forward. I will need a minimum of 2-3 days between the office visit and the surgery date (shipping time for the implants and the paper work to facilitate payment, if warranty is in effect). Would you like to schedule an appointment or call back after talking to your husband? I truly appreciate the patient who remembers the preoperative discussion and who read the information brochure (pdf file). I try very hard to make sure the woman knows that the saline implant is not permanent. Approximately 1% deflate within 1 year, 3% within 3 years, and 10% within 5 years. Because of the warranty set at 10 years, I caution all of them that the mean deflation is 10-12 years (or half at that point). I tell them that it is rare to have a deflation at 1 year, but it can happen. And yes, the implant may last for 20 years, but don’t count on it. I tell them to begin saving money, if they get to 8-9 years without a deflation because they will likely end up out of the extended warranty period. This is a picture of the finished quilt top from the previous post (Paper Work). It is 51" X 70" and will now be sent to a quilter (part of the QOV group). When finished it will be sent to a wounded (& hopefully recovering) soldier. The pattern is Flying Geese. Avoid slouching. Keep your neck and shoulders relaxed. Try to keep your elbow, hips, and knees at right angles (ninety degrees). Avoid pressure to the back of the knees. If your feet can't comfortably be flat on the floor, then consider a foot rest. You should also consider taking breaks every 30-60 minutes and do some stretching exercises for your wrists and hands and body. Sometimes, as in the OR, breaks can't be taken that often. Do the best you can with table/chair (computer moniter/OR table/etc) height and stretch when you are able. It will help keep the aches at bay and the joints a little more supple. That will allow you to enjoy your hobby (sewing, knitting, bloggin) and maybe your work for many more years.